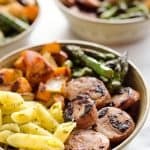 Roasted Veggie & Chicken Sausage Penne Bowls are a healthy gluten free dinner recipe bursting with bold flavors and wholesome ingredients. 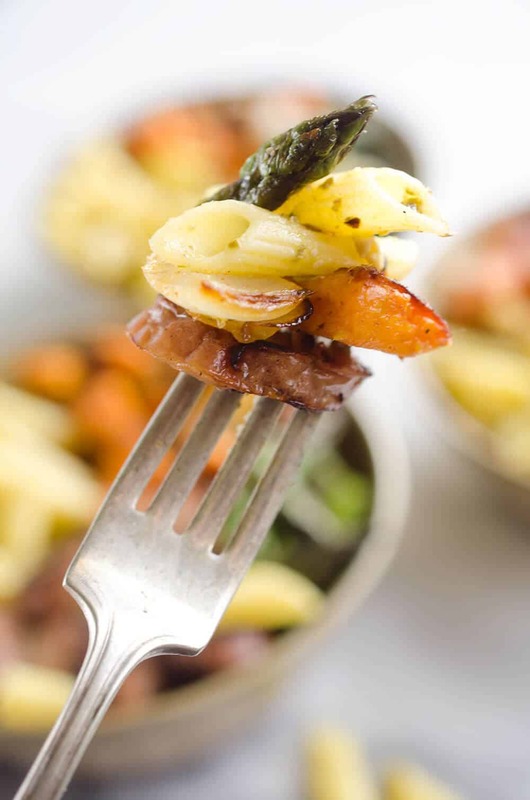 From chipotle roasted sweet potatoes and Aidells® Chicken & Apple Sausage to Barilla® Gluten Free Penne Pasta tossed in pesto, this dish is a well-rounded and satisfying meal you will love. I am officially in love with bowls! From 10 Minute Beef & Broccolini Bowls to a variety of Buddha Bowls, they are such a delicious and easy way to enjoy dinner. 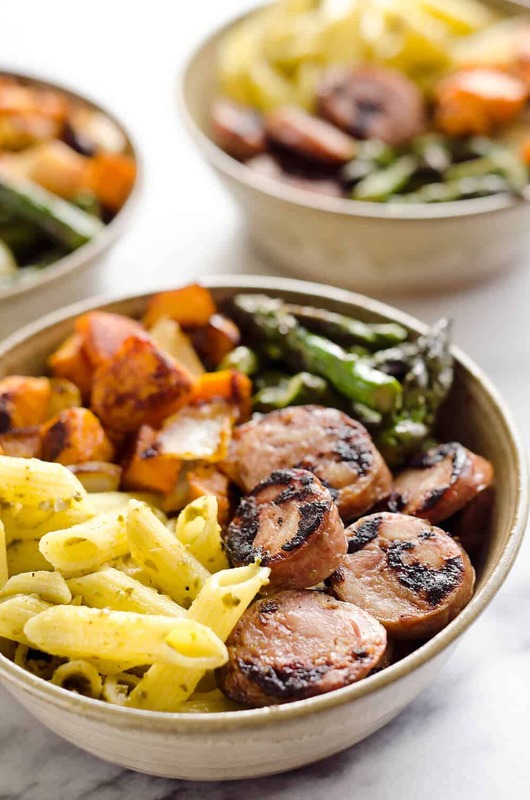 For these Roasted Veggie & Chicken Sausage Penne Bowls, it was an easy way to combine lots of wholesome ingredients in a well balanced meal. 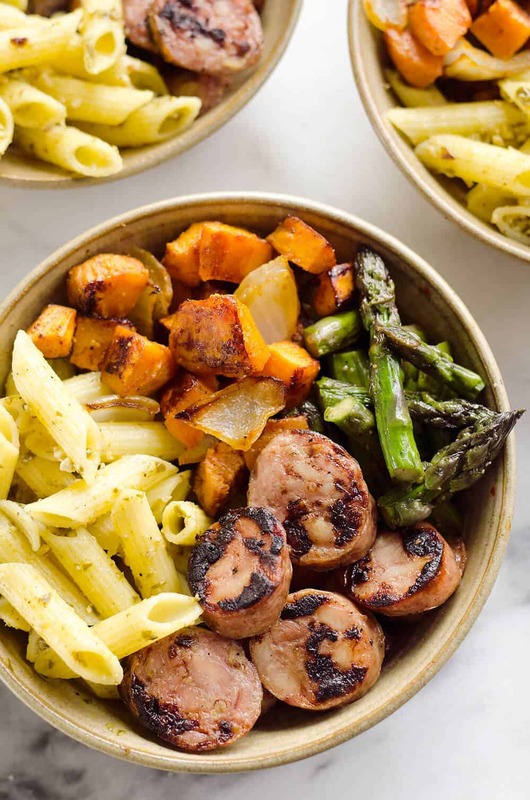 Chipotle roasted sweet potatoes and onions are joined by sautéed asparagus, Aidells® Chicken & Sausage Sausage and Barilla® Gluten Free Penne tossed in pesto. The combination of bold and spicy flavors combined perfectly for a healthy and delicious meal you will love! I had a friend coming over for dinner who follows a gluten free diet and I wanted to make something we could both enjoy. 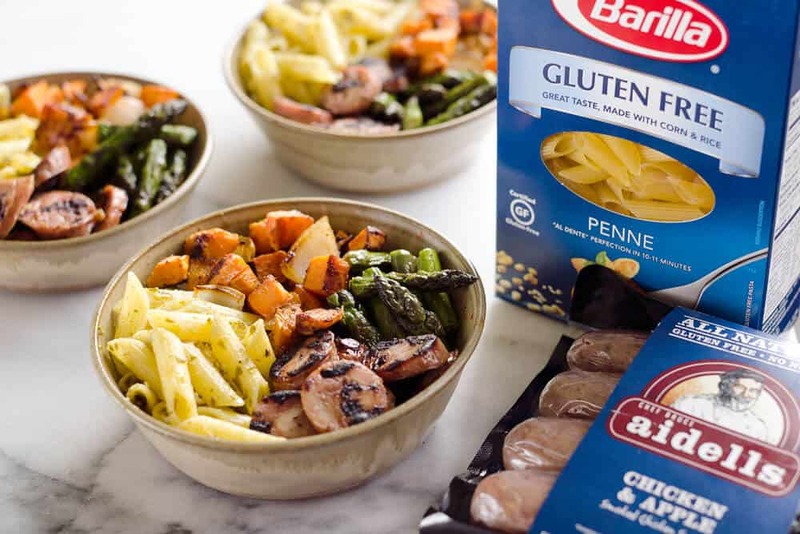 I ran across this Gluten Free Penne from Barilla® while shopping at Target and decided to give it a try. I have to admit I was hesitant at first, as I have never tried a gluten-free pasta before. While lots of my dishes end up being naturally gluten free, I don’t often purchase gluten free specialty items. I was pleasantly surprised by the pasta after I cooked it! When prepared al dente, this corn and rice blend pasta had a very similar taste and texture to a traditional wheat pasta. I kept it super simple by tossing it with some pesto from a jar. If you have an abundance of basil in your garden, you could certainly make an easy homemade pesto for an even fresher flavor. I roasted my sweet potatoes and onions with olive oil, garlic salt and chipotle seasoning for an extra kick. If you aren’t a big fan of spice, you can certainly skip the chipotle seasoning and just opt for the garlic salt or your favorite spice blend. You can also easily mix up the vegetable options with zucchini, squash, or any of your favorite vegetables that roast well. How beautiful is that bowl of colorful goodness?! I just love preparing a wholesome meal full of a variety of healthy ingredients. This dish has a great balance of nutrition with a good source of protein from the Aidells® Chicken & Apple Sausage. I packed up a few servings of this meal to enjoy throughout the week for lunches at work. It is so wonderful to have a meal packed for lunch that you can actually look forward to! 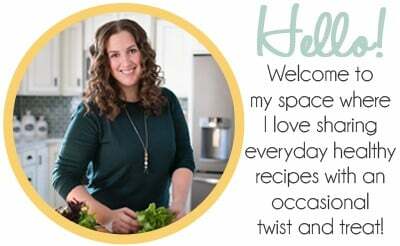 I get very excited about a delicious protein that is easy to prepare! I can simply slice up the sausage and sauté it for a quick and easy meal ready in just 10 minutes. 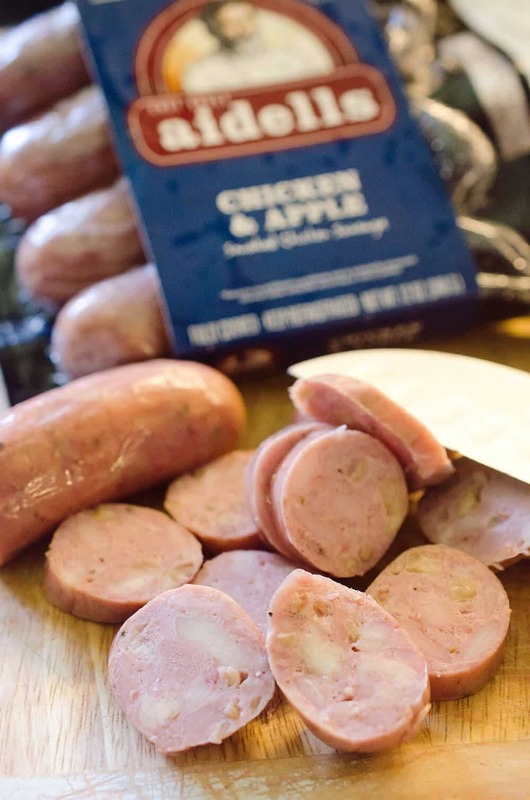 The balance of sweetness from the apples really balances the savory chicken sausage. Not only does it taste great, but I can feel good about the store-bought sausage that is hand crafted and nitrate free. I could happily eat this sausage all on it’s own for a quick lunch! If you haven’t jumped on the bowl bandwagon, I implore you to give it a try! 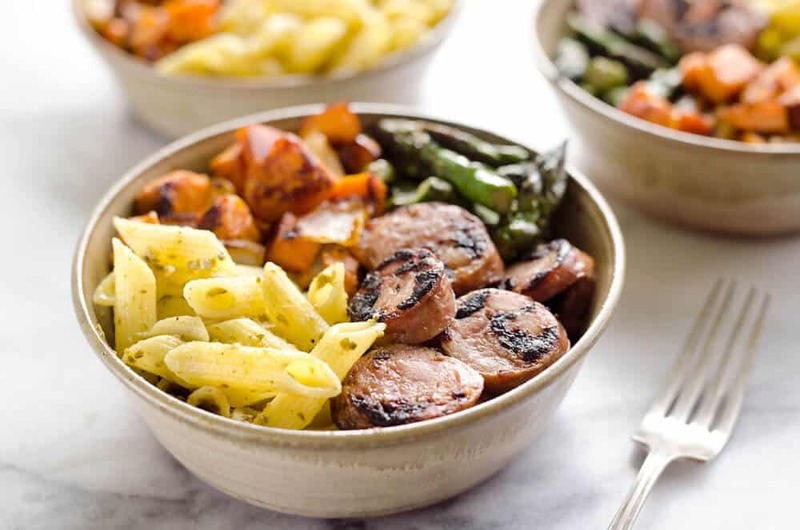 These Roasted Veggie & Chicken Sausage Penne Bowls are the perfect way to get your feet wet. 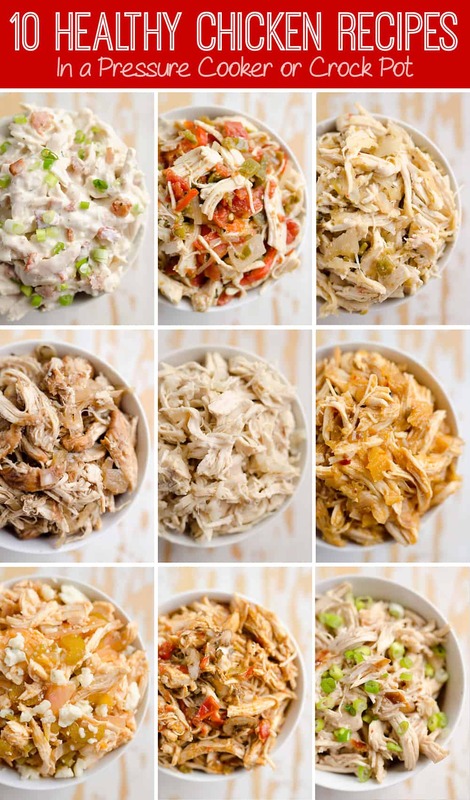 They are full of simple and wholesome ingredients that can be adjusted to your personal tastes. Embrace your foodie and find a combination that is perfect for you! Don’t forget to check out Cartwheel for great offers on your groceries at Target, including discounts on Aidells Sausage and Barilla Pasta! 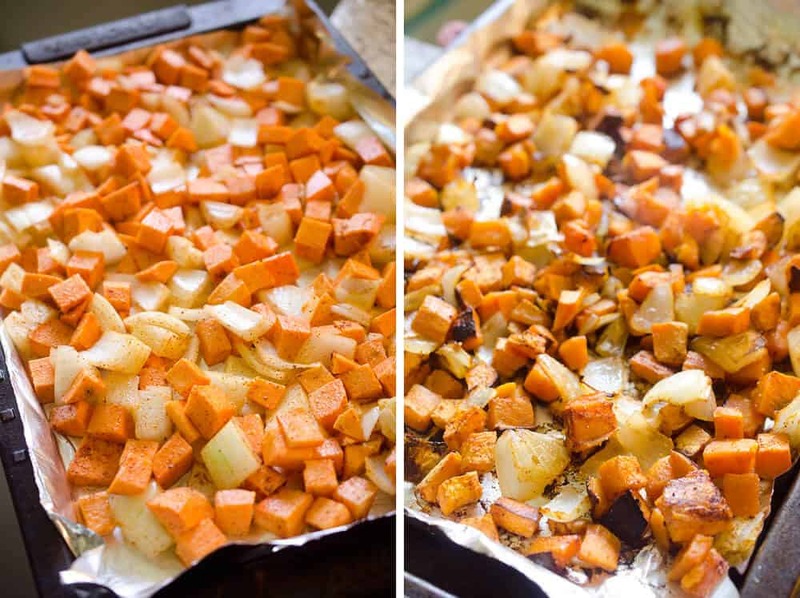 On a line baking sheet, toss the sweet potatoes, onions and olive oil until well coated. Sprinkle with the garlic salt and chipotle power. Give the vegetables another quick toss and place in the oven. Bake at 400° for 30-40 minutes, or until the potatoes are tender. Bring 3-4 quarts of water to a rolling boil, add salt to taste. Add the pasta to the boiling water and cook for 4-5 minutes. Remove from the heat and drain well. Toss with the pesto and add 1/3 of the pasta to each bowl. Meanwhile, slice the sausage into rounds and sauté in a non-stick skillet for 8 minutes on medium heat, or until heated through. Add 1/3 of the sausage to each bowl. Add the asparagus to the skillet and season with salt to taste. Sauté for 2-3 minutes. Divide all the cooked vegetables evenly among the bowls. Serve immediately. This looks divine! Love how light and healthy it is even with the pasta. I might be able to sneak this into my family’s diets! How do you cook the asparagus? I don’t see any instructions included on it. In the second to last bullet, it mentions that you should add the asparagus to the skillet and saute it for a few minutes.